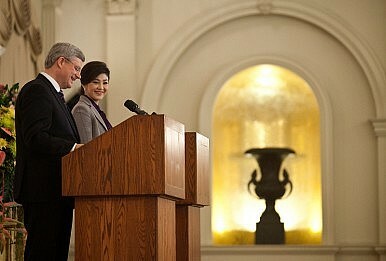 While PM Harper has made engaging Asia a priority, Canada needs added substance to its regional diplomacy. “Canada Denied Seat at East Asia Summit” screamed the headline in Toronto’s Globe and Mail, after an interview with ASEAN Secretary-General Surin Pitsuwan, visiting Ottawa on September 20. In fact Canada has not applied nor has it been invited to join this relatively new forum (2005) that meets annually and now includes the leaders of all the ASEAN countries, plus most of ASEAN’s dialogue partners (China, Korea, Japan, India, Australia, New Zealand, Russia and the U.S.—but not Canada) although Canada has said that it is closely following developments in the EAS. Seeking early admission to the East Asia Summit (EAS) was one of a number of recommendations made by the Asia Pacific Foundation of Canada in a report released earlier this month “Securing Canada’s Place in Asia” as part of its “National Conversation on Asia” initiative. While the headline attracted attention, the reality of Dr. Surin’s remarks were not quite as negative, but he did stress that Canada needs to re-engage with Asia on a sustained basis if it is to be welcomed into the emerging new regional architectures. Canada has a brand in Asia that has faded and needs to be updated. Surin noted the general goodwill toward Canada in ASEAN, its history of engagement with the organization going back to 1977 when it became a Dialogue Partner, and the work done by CIDA in the 1980s. Canada is “qualified” to be an EAS partner, but inconveniently for Canada, there is now a moratorium on new membership in the EAS while the forum takes stock of its role and digests its most recent members, Russia and the U.S. Thus timing becomes an issue and patience is required. Patience is one commodity that the government of Stephen Harper does not seem to have in large supply when it comes to Asia. This is perhaps understandable given that there is a lot of catching up to do. Since winning majority government status in 2011, the government has embarked on a whirlwind series of initiatives in the region, ranging from rebuilding relations with China through high-level visits, to aggressively lobbying the members of the Trans-Pacific Partnership (TPP) process to admit Canada, to taking initiatives on Burma (lifting sanctions, establishing a new embassy). While it is clear that Canada is trying to make up for a lost decade or more during which relations with Asia suffered from benign neglect (to put the best possible face on it), a long term, sustained commitment will also be required. From the Prime Minister himself, to the peripatetic trade minister Ed Fast, to Foreign Minister John Baird and Defense Minister Peter MacKay, over the past year Canadian political leaders have made considerable efforts to be present more frequently in Asia. Hilary Clinton famously drew on the Woody Allen’s maxim that 80% of success is just showing up to explain her commitment to face-to-face diplomacy, especially in Asia, –and there is no question that showing up is important. But the U.S. also has the kind of assets in play that give real substance to the presence of U.S. officials. Now that Canada has decided to show up more often, there is a matching need for additional substance—evidence of long term commitment and resources– behind the presence. Some in Canada have dismissed the importance of Asia’s regional organizations, but this smacks of resentment especially when all the other main players are engaged. Showing up is good, but just showing up is not enough. Having allowed its Asian connections to atrophy, Canada now has to earn its way back into the key councils of the region. That was the message delivered by ASEAN Secretary-General Surin and there are signs that this message is being heard. Hugh L. Stephens is Executive-in-Residence at the Asia Pacific Foundation of Canada Home | Asia Pacific Foundation of Canada and Principal of TransPacific Connections (TPC Consulting ) |tpconnections.com. He is based in Victoria, BC, Canada. A new report urges the Harper government to transform Canada’s economic engagement into a comprehensive approach.